Is Freemasonry influenced by Greek philosophy? or just uses a specific ideas that helped in geometry only ? I suppose it is fair to say that Freemasonry is as influenced by Greek philosophy as mankind is influenced by Greek philosophy. any specific tents or ideas or only a general knowledge ? Well….none come to mind, but then again, I’ve never been able to cite any Greek philosophy tenets from memory. I would say, rather, that Freemasonry may be influenced by some of the same tenets that Greek philosophy was influenced by. Some suggest that Greek philosophy itself originated from older teachings. The tenets of our institution are brotherly love, relief and truth. Wherever those concepts originated is where you’ll find Freemasonry’s roots. My guess is those concepts originated long before the inception of Greek philosophy. While there are references to the Greeks in our ritual, they are not specifically cited for philosophy. Certain Greek philosophers are mentioned as being brother Masons and we acknowledge their wisdom. Understand that Masonry is not a school of Philosophy. Nobody writes our lessons on a blackboard to be copied down. The teachings of our Craft are through allegory and the degrees are only a foundation upon which we may build our spiritual life. 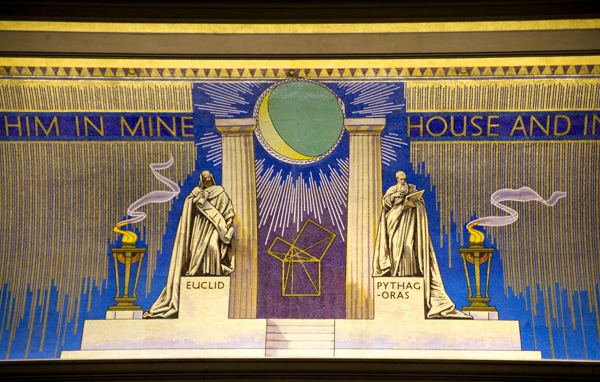 This is probably the closest ‘influence’ - it’s a picture of part of the ceiling of the Grand Temple at UGLE. The two are regarded as ‘fathers’ of Freemasonry because of their mathematical and architectural expertice .. but that’s all. It’s worth also noting that there are Royal Arch Chapters named after them in Cambridge; Euclid being the Chapter with connections to the University - Pythagoras Chapter being the oldest in the Province. The theorum (depicted between them in the picture) is used in UGLE to denote a Past Master and appears as part of the breast Jewel worn by them. If there are not stronger influence why freemason scholars determinate masonry as neoplatonic society…. And is it from credible sources story that Pitaghorian theorema was kept as a secret by your ancestors? I suppose that complete sentence from logo from your link is “But I will settle him in mine house and in my kingdom for ever: and his throne shall be established for evermore.’” Can you tell me closer meaning of that/? Can you tell me your view meaning “ouroboros”(snake or dragon eating his tale), also presented on that and many others masonic logos? Do you use Gadsden flag for some deeper meaning than common meaning it has in your nation? too much question without order:-) so I can add one more anyway:-) How you keep ESOTERIC(occult=hidden knowledge) and ALTRUISTIC(love for mankind) together? If you have some receipt to “make good men better” why dont share that receipt to all humanity? Aren’t there millions of good men* beyond your group? And dont be mad on me I just ASK . Please provide references for the idea that Freemasonry is a Neoplatonic organization. We are not a religion and do not teach that all eminates from “the one”. as Neoplatonism teaches. Craftsmen passed on the secrets of their vocation to their apprentices. The science of geometry of which the Pythagorian Theorem is part was one of the secrets of Freemasonry. Of course it was not freely shared. It’s from the bible. It’s a reference to heaven. Can you tell me your view meaning “ouroboros”(snake or dragon eating his tale), also presented on that and many others masonic logos? I’ve never seen that symbol in relation to Freemasonry. Do you use Gadsden flag for some deeper meaning than common meaning it has in your nation? Again, not a masonic symbol. Of course, you are not qualified to join us, so seek our knowledge and secrets any way you can get them. How you keep ESOTERIC(occult=hidden knowledge) and ALTRUISTIC(love for mankind) together? That’s correct and we teach nothing that isn’t available to anyone through their faith or at their grandmother’s knee. We just have a particularly effective delivery method for those lessons. In order to be part of our order you must be qualified and vouched for. If you are not qualified, you cannot join and receive the benefits of our Fraternity. Thank you for your patient answer. Gadsden flag(yellow flag with snake and ” d o n t t h r e a d o n m e “) I saw in masonic museum in USA(not been physicaly there but watched filmed tour). It is from civil war, the only one you had until today), it often has been said that it was designed by one of George Wahington ‘s generals(majority of them was freemmasons). Message is pretty clear but I ask has it some deeper meaning for you(in your referent system, which is(as I see it) beyond traditional good vs. evil dualism). Ouroboros, snake or dragon eating its tale is symobl I often see in relation with masonry, it is even represented on the link provided by Richard George, along the sun/moon circle? It is not from our Civil War. It is from our revolution. That snake on the flag is not eating its tail. The rattlesnake was actually a rather common symbol for the colonies that were to become the USA during the second half of the 18th century (1754 being the first known usage). As for the message, what do you think happens if you step on a poisonous snake? Snake on Gadsden flag does not eat its tale, yes I rode that origin as symbol for separated colonies. But what about snake presented on logo from above link? Sorry, I’m having a hard time understanding what you are asking. Also, I don’t know what other snake image you are talking about. It represents a circle and eternity (as a simple Google search would have told you ..) - a circle having no beginning and no ending and therefore represents eternity. Nothing more. It’s an old symbol and has represented eternity throughout antiquity. As I recall, the snake eating its tail is one of universal depiction of creation. It is fairly prevalent amongst southern indian tribes in the US and Mexico. I dont recall which ones, off the top of my head, but it relates to their myth of the origins of the universe. But, to the best of my knowledge, there is no reference to this in Masonry. Ouroboros is actually quite a common symbol - it represents Birth, Death and Rebirth - hence eternity .. and rather appropriate for the religions that have the concept of Birth, Death and Rebirth in to the Afterlife .. and eternity. As I say, it dates back into antiquity. Page rendered in 0.3371 seconds.